"Jimmy Olsen's Big Week: Day Four"
"The Black Ring: Part Seven"
The Secret Six are about to rescue Lex, but before we see why, we jump back a few weeks. Lex is having dinner with Scandal Savage, his plan is to hire the Secret Six for a mission, like any other client but the payment is something Scandal and Bane are keeping quiet about. Watching from the air vents Scandal is shocked to discover her target is... her father! Savage questions Luthor about the prophecy but to no avail, whilst elsewhere Lois Bot is reactivated by a memory-cloned host of Mr. Mind. The host reveals that Lois Bot had reprogrammed one of his henchmen with a nano virus that prevented him from killing Lex. Thus a revelation that Lois Bot has a loyalty to someone other than Luthor but not before Lois Bot erases the memory from the human host and leaves. The Secret Six leap in and attack, but halfway through the attempt Lois Bot arrives and stomps through them all. When it smashes Scandal to a pulp, Vandal can stand by no longer and literally cuts through Lois Bot. To be concluded in Secret Six #29. Story - 2: Not much in the way of story or character development and to be honest the revelations weren't that interesting or in fact revelatory. 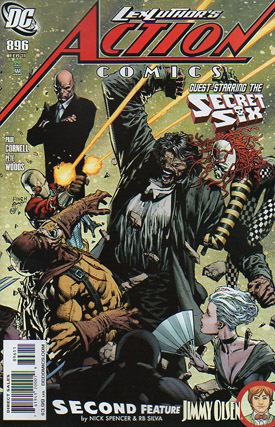 The only shining dialog came from the Secret Six and there really wasn't enough to make the issue entertaining enough. If anyone can't see a Brainiac appearance in the making I'd be shocked. Art - 3: The art is promising with plenty of action to be had, even the comedy moments of the "pass the parcel" detonator were made more interesting and less cheesy than they could have been. I commend Pete Woods for making the most out of a minimal script. Jimmy has been roped into a charity dating auction. Sebastien made it out of the Secret Six versus Vandal Savage attack (but you won't know how till you spend more money). Jimmy is very unhappy about being involved and even more so when he realizes Chloe is also available to bid upon! Chloe fetches ten thousand dollars via Mr. Mallory, but nobody is more shocked than Jimmy when he raises a million when a beautiful young woman named Maggie appears as if from nowhere with a case full of cash. For the first time in a long time Jimmy is not thinking about Chloe, everything is going amazingly well until during dinner at a restaurant, the staff get Jimmy's order wrong. As if by magic the order is corrected and alarm bells begin ringing. He asks Maggie her last name but she replies it's unpronounceable handing him a business card instead. With one look at the card Jimmy races to the bathroom, locks himself in and tries to escape but in the blink of an eye Jimmy is in a lobby next to Maggie at what looks like... Jimmy's wedding day! To be continued in Jimmy Olsen #1. Story - 3: I feel a little sad that the back up is more entertaining than the main feature but that isn't really saying much! I am finding Nick Spencer's take on Jimmy far more entertaining, not that he's had a little time to breathe. The monologues and snide remarks make for very comical scenes. Art - 3: As with the story, RB Silva's art has also come into its own, perhaps dwarfed because it's far shorter than the main feature so it's taken a lot longer to grow on the audience. It's very well suited to Spencer's script and very easy on the eye. Cover Art - 4: Didn't happen but it's still a pretty cool cover! Maybe a little heavy on the Hulkesque imagery and the inks but a very nice action-packed cover.